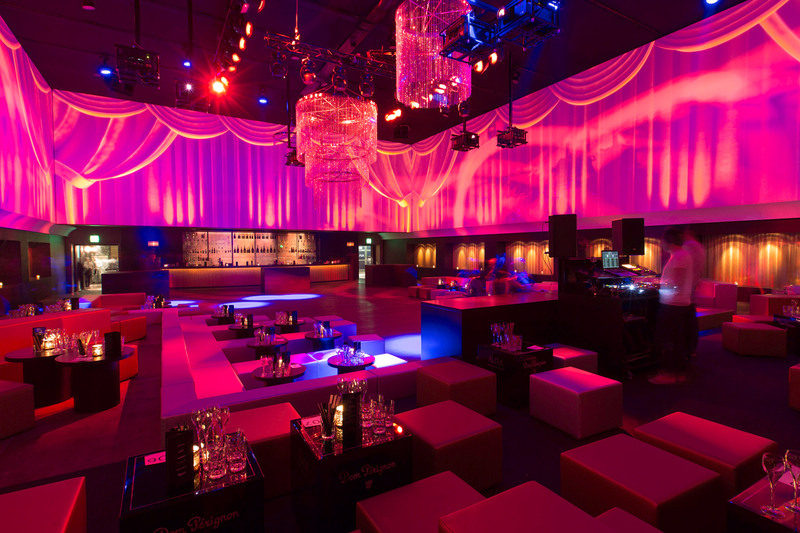 Set in one of Zurich’s most prestigious neighborhoods, the AURA introduces a new level of glamour and luxury to entertainment environments. Built within the historic 21,000 sq. ft. (2,000 sq. 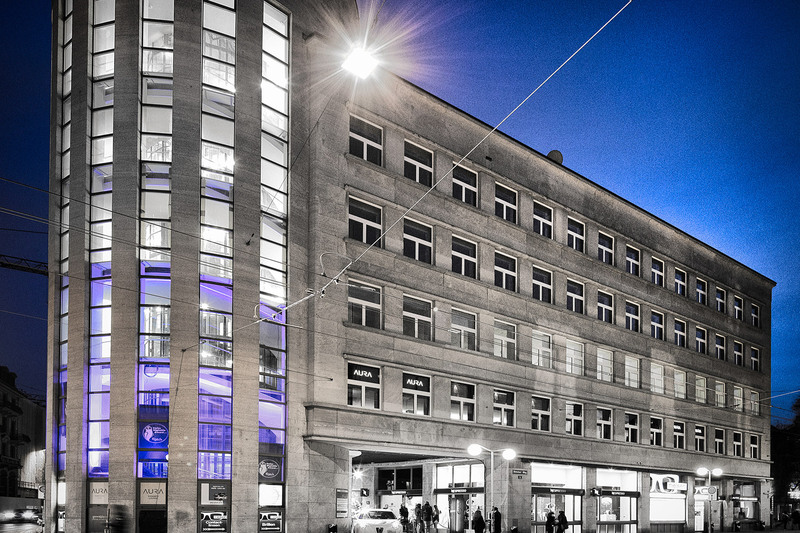 meter) former “Alte Boerse” Zurich Stock Exchange Building, AURA encompasses four distinct settings, a 100 seat gourmet restaurant, an intimate bar, a chic, stylish smokers’ lounge and, a 4,800 sq. ft. (450 sq. meter) Events Hall capable of accommodating up to 500 guests. 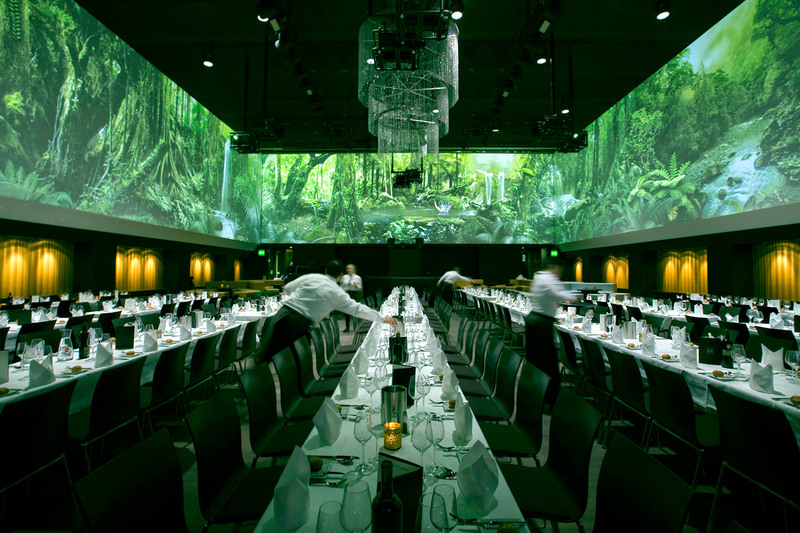 Featuring groundbreaking 360° panoramic video projection and 3D audio systems, the Events Hall is designed to host galas ranging from awards and fashion shows to banquets, weddings and corporate gatherings. AURA’s uniquely flexible, multi-purpose strategy required the amalgamation of state of the art technology, within a highly sophisticated acoustic environment. The video presentation system engages eight, ceiling-mounted, high-performance projectors. Audio distribution employs a total of 80 loudspeakers, (70 of which are skillfully concealed by acoustically transparent, architectural construction). Deploying such a massive arsenal of cutting edge technology within this urbane, 21st Century atmosphere necessitated an extremely flexible and creative systems integration. 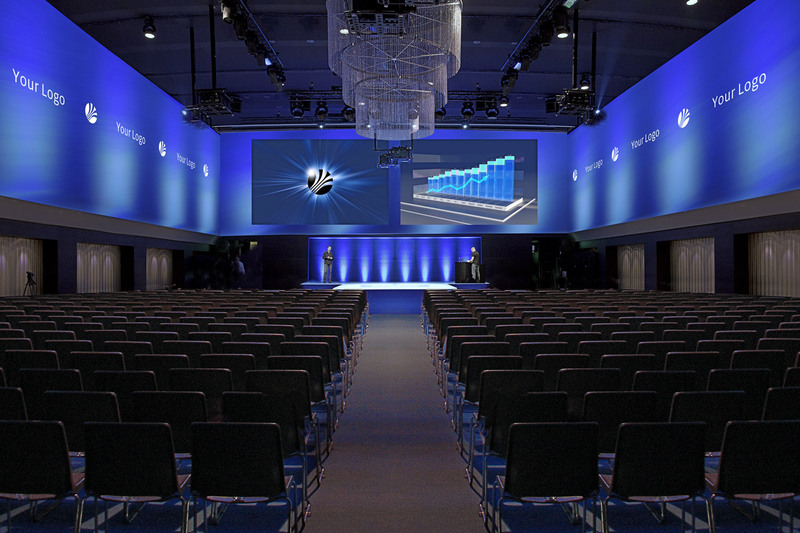 Aura’s vision for 3D audio presentation required full integration with the venue’s video imagery and innovative lighting, to establish a combined central focus for the Events Hall. All three elements were tasked with functioning interactively, to achieve a fully immersive environment capable of completely engaging guests within messaging and/or entertainment programs. WSDG’s Basel office was retained to design and coordinate the massive sound isolation planning and construction project to fully adhere to Zurich’s stringent city center legislations and limits. Various preset programs were developed to enable a myriad of speaker combinations (all together, or in an infinite range of individual or cluster groupings), depending on need, e.g. live performance, 3D surround sound, etc. Additionally, the ‘sweet spot’ can be expanded to encompass the entire room, providing a spatial sound experience for all guests. Multiple touch panel control units were programmed to provide sound mixers and engineers with the most comprehensive and user-friendly system management possible. The sound-to-video touch interface provides automated or live control of any projected video image. All imagery can be customized to react to sound and video controls in terms of size, shape or color.